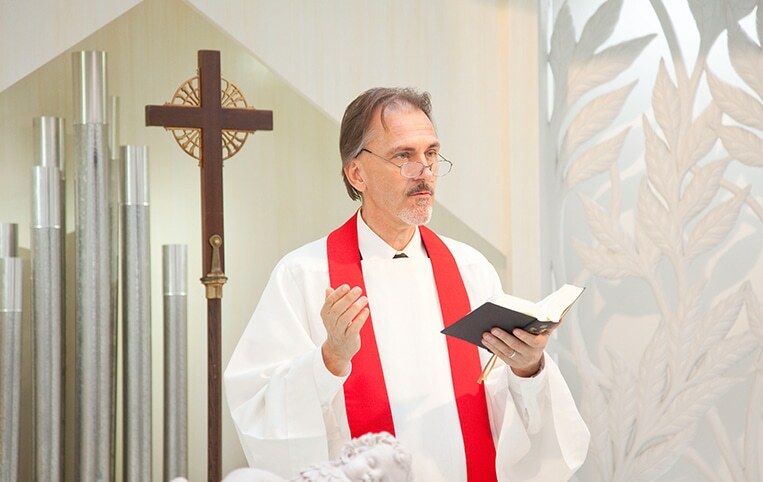 CELEBRANT for wedding chapel in Tokyo,Saitama,Chiba,Kisarazu,Mito,Oyama,Utsunomiya,Yamagata,Sendai,Fukushima, Koriyama,Numazu,Shizuoka,Hamamatsu.Ordained Pastors and Missionaries are welcomed.Spouse visa holders or permanent residents with strong Chirsianity background are acceptable.Working visa holders are also acceptable. (But some condition is required) Those who hold Spouse visa,permanent resident visa or working visa need to pass a certification program.Daily Japanese conversation ability is required.Details are at interview.Send resume and letter onf Christian background to TMC Tokyo office. Greet the wedding hall staff in a cheerful manner as you head to the changing room. Once there, change into your pastor’s robe and proceed to the chapel with your script and Bible. You will meet the bride and groom, and their parents, for the first time. After greeting them, the wedding rehearsal will begin immediately. You will participate in this brief rehearsal during which the couple and parents learn the progression of the ceremony. Making the couple feel relaxed at this point is a key to a having a wonderful wedding. After all the guests have entered the chapel, the ceremony will begin. Against a background of organ music, you will enter the chapel with the groom. You will then give a brief opening speech, after which the bride will enter with her father. 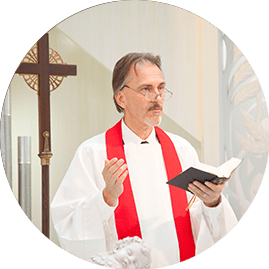 Once the bride has been handed over to the groom, the couple will stand before you as you guide the ceremony through the singing of hymns, prayers, the vows, the exchange of rings, and the signing of the certificate. The beautiful music, your gentle support with the couple, the drama of the exchanged vows, and the happy moment when the guests applaud the newlyweds all work together to create an unforgettable memory for the couple, their family, relatives, and friends. With the wedding successfully performed, you return to the changing room where you change from your robe back into the suit in which you arrived. Your fellow TMC members will also return to the changing room, and after confirming the details of the wedding together, you may leave the wedding hall. The wedding ceremony will naturally become one of the most cherished memories of a married couple. And their parents, relatives, and friends participate in this wonderful experience as well. The celebrant has the happy opportunity to help create this once-in-a-lifetime sense of joy for everyone. With a careful balance of dignity, cheer, and drama, it is in his power to conduct a wedding which allows the couple to share their own happiness with all the other guests. Very few joys in life can compete with the sight of a loving couple walking arm-in-arm down the aisle amid the happy congratulations of their family, friends and relatives…an atmosphere which you played a big part in creating. We will give you full training to support you until you get confidence of the job. The celebrant has the happy opportunity to help create this once-in-a-lifetime sense of joy for everyone. Copyright©Tokyo Music Center All Rights Reserved.